This keyboard tray is no longer available. Shop our full selection of Most Popular Ergonomic Keyboard Trays to find a great replacement. When you work on a corner desk, you need a keyboard setup that works with you, not against you. Try the Humanscale 600 Extender Keyboard Tray for more comfortable typing within your Neutral Reach Zone and feel the difference. The Humanscale 600 platform design supports nearly all standard keyboards and fits perfectly into a 90° or sharply radiused corner, letting users of trickier desk configurations build the desk of their dreams. Select the mechanism, mouse platform, palm support, and other customizable options to suit your particular needs with our Design Your Own option. The Humanscale 600 Extender Keyboard Tray is only available in Black. Loosen knob to adjust and lock back into place. Unlike the 5G or 6G, this mechanism has no reference for keyboard platform angle. Humanscale's newest dial-a-tilt mechanism that instantly adjusts the platform's tilt without the need to lock or loosen any knobs or levers and slimmer than the 5G. The dial-a-tilt mechanism instantly adjusts the platform's tilt without the need to lock or loosen any knobs or levers. Its solid build quality and simplicity make this mechanism the most popular mechanism Humanscale offers. 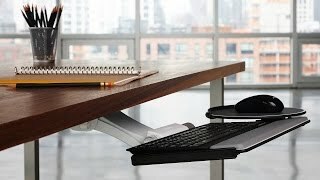 This mechanism goes 4" farther underneath a desk surface, getting a keyboard tray stored out of the way on a shorter track, perfect for desks with limited depth or small spaces. This mechanism is the 2G mechanism, but with a longer arm for use above a work surface. It works well for sit-to-stand solutions. This mechanism features a pre-set 0 degree tilt and knob-free adjustment. All Humanscale mechanisms pivot 360 degrees from the point where it is mounted to the track. Some users have a need for additional side-to-side adjustability. The lateral slider provides for eight extra inches of movement from right to left. This is a useful feature for someone at a large workstation that requires them to type facing different angles or monitors. The track mounts to the underside of your work surface. It directs and supports the Humanscale mechanism and keyboard tray as it slides forward and back. Standard length on most mechanisms is 21 5/8 inches. That length ensures that the keyboard tray can be completely stowed under your desk when not in use. Some mechanisms come standard with a shorter or longer track. Consult each description for that information, but all systems can be ordered with any track length. The clip mouse platform is the only mouse platform that allows the user total adjustment control in all three dimensions- height, depth, forward/back and tilt, allowing it to be adjusted precisely the way you need it. It also easily snaps onto either side of the tray for left or right use, and it's available in two sizes and different height ranges. Note: The high clip has an extra one inch height for additional adjustment and usability and is the most popular accessory we sell. The swivel mouse mounts underneath either the left or right front corner of the platform. It swivels out from underneath the keyboard platform easily and tucks out of the way when not in use. This mouse platform is available in right, left and dual configurations. The main difference between the clip mouse and swivel mouse is the adjustability. The swivel platform stays on the same tilt or angle as the keyboard tray; the clip mouse angle can be adjusted independently. The M2 offers all the advantages of the swivel mouse, but it is slightly larger and offers a uniquely shaped platform. This lets a user bring the mousing surface closer to their body for a lower risk mousing position. The Humanscale 600 Extender Keyboard Tray can be ordered with a black mouse pad to fit any of the available mousing platforms. A second mouse pad can be ordered with the Humanscale 600 tray for configurations utilizing two mouse platforms. Select from two different palm rest options for your Humanscale 600 Extender Keyboard Tray: foam or gel. Both are covered with an easy to clean, black synthetic leather. A slim gel palm rest with a black or silver synthetic leather cover is also available for users with thin keyboards. Slim palm rests are not compatible with swivel mouse platforms. When designing your Humanscale 600 Extender Keyboard Tray, if you choose to not add a palm support, there will be holes located at the installation points on the tray. This is normal and part of the keyboard tray's design, but if you do not want a palm rest and installation holes in your tray, we suggest ordering another keyboard tray. If you have any questions or need help choosing a keyboard tray, please don't hesitate to call us! Increase the surface area when mounting your keyboard tray system in the corner by adding an optional corner sleeve. The Humanscale DE100 corner sleeve fits desks that are 1'' to 1.5'' thick. This keyboard's split design promotes a more natural and ergonomic typing position. Clear up desktop space and keep your computer tower off the floor by mounting it to the underneath of your desktop. This accessory is great for height-adjustable desk users. Mount a monitor weighing between 4.5 lbs - 17.5 lbs, and adjust the height, depth or lateral position with easy fingertip adjustment.